While there are almost 100 different sleep disorders, the most common are Obstructive Sleep Apnea (OSA) or Insomnia. There are two main types of Sleep Apnea, the most common being Obstructive Sleep Apnea (OSA). Sleep normally induces a state of decreased muscle tone throughout the body. This usually results in some relaxation of the muscles of the tongue and throat but not enough to cause a complete collapse of these passages. However, for those who may be predisposed by being overweight or by having an enlarged palate, receded jaw bone, or a genetically narrowed airway behind the tongue, the airway can collapse during sleep. When this occurs, body oxygen levels plummet and the brain reflexively increases heart rate, blood pressure and finally awakens you so that breathing may be resumed. This constant fragmentation of sleep leads to adverse health outcomes, including daytime sleepiness. Rarely, other cases of sleep apnea occur where the sleeping brain does not send nerve impulses to the diaphragm muscles which are responsible for breathing. This is called central sleep apnea (CSA). Loud snoring, especially while sleeping on your back, is often the most common symptom of untreated sleep apnea. It may also be associated with choking and gasping during sleep. Sleep not only becomes very restless and light but it also may be associate with increased perspiration, heart palpitations and even nighttime panic attacks. Having to frequently wake to empty your bladder is a common symptom associate with OSA. For those with Diabetes, you may also notice difficulty in controlling your morning blood sugar results. Similarly, difficult to manage high blood pressure may be due to untreated OSA. Other important symptoms include decrease in daytime concentration, memory and potentially mood. 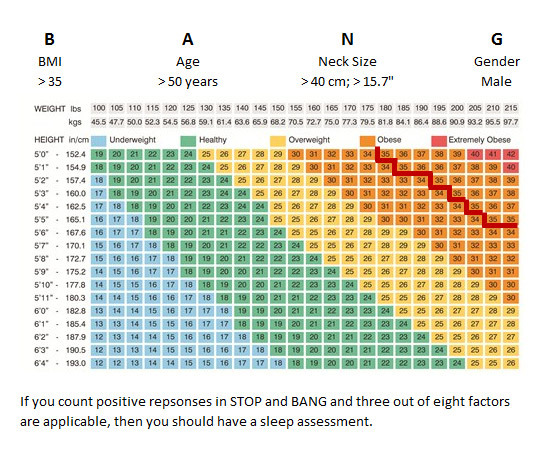 The STOP BANG questionnaire can quickly determine if you have a strong likelihood of having OSA. There is a good chance that you have Sleep Apnea if you have any of two of the above as Yes. Diagnosis is usually made through a combination of consultation with a sleep specialist and undergoing an overnight sleep study, otherwise known as polysomnography. These tests are usually conducted in an approved sleep laboratory. This approval is provided through the Ontario Ministry of Health and Long Term Care’s Independent Health Facility Program with oversight through the College of Physicians and Surgeons of Ontario. The treatment plan usually begins by making important lifestyle changes, especially if weight loss is needed. Some positional devices that help to promote sleeping on your side may also be of some benefit. The use of sleeping medications is always discouraged unless it is absolutely essential for treatment. Alcohol and similar drugs that depress the central nervous system (tranquilizers, marijuana, etc) should be avoided. In addition to the above, a positive airway pressure (CPAP or APAP) device may be required. These devices must be purchased through an approved vendor who can also utilize the Assistive Device Program (ADP) to help you fund your equipment. These dev ices are made up of a compressor which blows air through a tube into a mask placed over the nose. In turn, this pressurizes the nose and throat allowing it to remain open (or preventing it from collapsing) during sleep so breathing may be normal. When adequately pressurized, snoring is also eliminated and blood oxygen levels remain normal. The ultimate goal is to allow sleep to be uninterrupted. Some very mild forms of OSA are sometimes amenable to Surgery of the palate, tonsils or reconstruction of the jaw and performed under general anesthesia in a hospital. Alternatively, there are also oral appliances that can help relieve snoring and mild to moderate sleep apnea by forwardly positioning the jaw. These are worn only at bedtime. 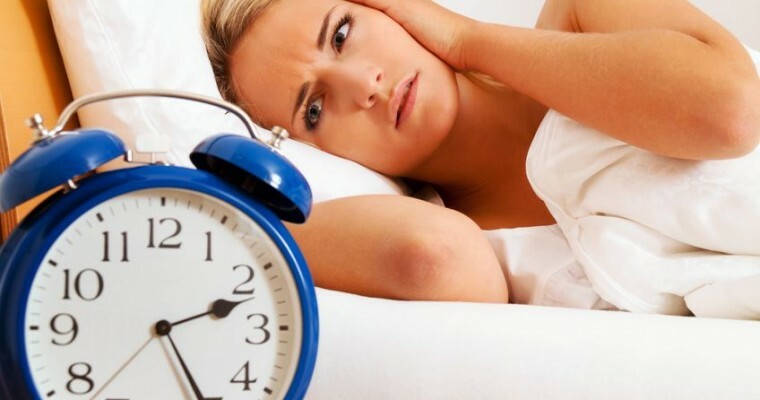 Insomnia refers to the inability to fall asleep and or stay asleep, early morning awakening or non-refreshing sleep lasting for at least one month and is associated with impairment in your functional well- being. It can be classified in three subtypes, according to its duration. Transient Insomnia usually lasts from days to weeks. It can be caused by another medial disorder (e.g. one that causes pain), by changes in the sleep environment (e.g. noise or temperature), by the timing of sleep (e.g. jet lag), severe depression, or by anxiety and stress. Acute Insomnia refers to the inability to consistently sleep well for a period of between three weeks to six months. Another method of categorizing Insomnia, refers to it pattern of awakening during the night. This is usually referred to as Initiation Insomnia (inability to fall asleep), Maintenance Insomnia (inability to stay asleep) or Terminal Insomnia (falling to sleep normally but waking up earlier than expected). No matter the type or cause, insomnia can often be one of the most troublesome sleep disturbances of them all. Three quarters of all people who suffer from insomnia usually can be found to have a specific cause. Some of the more common factors involve stress related to work or family. Difficulty initiation and maintaining sleep throughout the night is a common finding associated with stress. Some individuals can resolves stress easier than others and this will impact the natural course of how long the sleeplessness persists. Other important causes include medical conditions that may interfere with sleep. Acute or chronic pain, breathing related conditions such as COPD or Asthma, heart conditions such as congestive heart failure or angina are just a few. Others include mood related disturbances, like depression. Acid reflux, pregnancy, thyroid disorders, restless leg syndrome, dementia, addictions, urinary urgency, etc. Lastly, there are a host of environmental factors that can interfere with your sleep. In fact, there are so many conditions, be it medical or environmental, that may result in insomnia that this is exactly why an expert investigation into your specific symptoms is always warranted. Who is at Risk of Developing Insomnia? Well, this could be almost anyone. In fact, nearly one in ten adults suffers from Insomnia. That said, certain individuals seem to be more vulnerable. As mention, those who have a lot of stress or anxiety in their life or who are suffering from another medical condition are definitely at risk. However, individuals with irregular sleep cycles (shift workers, those travelling across time zones, etc) are also at high risk. Sometimes genetics can also play a roles. If a parent or close relative suffers from insomnia, then you are more likely. Woman are twice as likely as men to develop insomnia. Lastly, there are some age related changes that result in fragmentation of sleep such that the elderly often suffer from insomnia symptoms. While Insomnia can be considered a diagnosis in and of itself, most sleep experts consider it to be only a symptom of some other cause that leads to sleeplessness. This is exactly why it is always necessary to consult a physician specialized in Sleep Disorders. Only after a thorough history and investigation, can the underlying cause be found and treatment initiated. Rarely will it require an overnight sleep study but if there is concern that another sleep disorder may be responsible for the symptoms of insomnia, a sleep study may be ordered. Only after symptoms persist for one full month can a diagnosis be made. It is considered to be chronic if symptoms persist more than six months. If an underlying cause for the Insomnia is found, it is essential to treat that first. If the symptoms of insomnia persist long enough, they can often seem to take on a life of their own, even when the underlying cause is fully resolved. This is often called Learned Insomnia, or Psychophysiologic Insomnia. It refers to a heightened arousal secondary to the underlying belief that one is unable to sleep. This arousal is often beyond a person’s immediate control and is more like a reaction to the stimulus surrounding the events leading up to the bedtime. For example, entering the bedroom may result in an increased heart rate, breathing rate and blood pressure. Most commonly, but often inappropriately, sleeping medications are used. In fact, off the shelf sleep medications are rapidly becoming one of the top selling non-prescription medications. While there may be role for a short course of pharmaceuticals, behavioural strategies (Cognitive Behavioural Therapy for Insomnia) is twice as effective for treating insomnia in the long run. Snoring occurs as the airway partially collapses such that the air that does pass through vibrates against the soft tissue and creates the loud noise. Snoring, therefore, indicates that there is some resistance to the normal path of air from the outside to the lungs. Snoring is associated with disrupted sleep, daytime fatigue and sleepiness, and decreases in oxygen levels in the body. Snoring can also be extremely disruptive to the sleep of the bed partner and can stress interpersonal relationships of couples. Treatment is can be similar to that for OSA, but often focuses on weight loss therapy if indicated. Upper Airway Resistance Syndrome (UARS) commonly presents as chronic daytime sleepiness, snoring and brief but frequent arousals during sleep. Similar to OSA, there are often recurring breathing events during sleep caused by the narrowing of the airway which results in an increased effort to breathe during sleep. Treatment options exist for UARS and may be similar to that as for OSA. Central sleep apnea (CSA) and sleep related hypoventilation/hypoxemic syndromes are sleep related respiratory conditions. CSA occurs when a person repeatedly stops breathing during sleep because their brain does not cue the body to breathe. This differs from obstructive sleep apnea since in central sleep apnea, there is no breathing effort because there is no drive to breathe. In its primary form, CSA is the result of instability of the breathing control system as the individual transitions from wakefulness to sleep. It is often seen in the very young (newborn infants) or the very old, as a result of brain injury such such as stroke. Treatment is often difficult but may involve positive pressure or even ventilatory support. Restless Legs Syndrome (RLS) is a neurological disorder that can affect quality of life and health. While the majority of RLS patients also have a diagnosis of Period Limb Movement S (PLMD) witnessed during an overnight sleep study, many patients with PLMD do not have restless legs syndrome. RLS is about twice more common in women versus men and increases with aging. A substantial number of people who have restless legs syndrome (RLS) also have periodic limb movements of sleep (PLMS). These are limb movements of 0.5-5 sec duration that typically occur in batches of 30 minutes or more with a periodicity of 5-90 minutes during the night. This can cause partial awakenings that disturb sleep. Typically, these movements affect the legs but they can also present in the arms or over the entire body. Poor sleep can seriously impact work, relationships, and health. PLMD typically does not require treatment unless they cause significant arousals during sleep resulting in symptoms of excess daytime sleepiness. In this case, your Sleep Physician will discuss a strategy to rule out any underlying causes (e.g., low iron) and implement therapy when required. (ESD) is the main symptom. However, the sleepiness cannot be due to insufficient sleep (sleep deprivation), disturbed, insomnia, circadian rhythm disorders, sleep-related breathing (sleep apnea) disorders, any other cause the disturbs the night’s sleep (environment or medical issues). This refers to a group of nighttime behavioural disorders that can occur at any age. These can include Sleep Walking, Sleep Talking, Night Terrors, Confusional arousals, REM Behaviour Disorder, Sleep Paralysis and Nightmares. Often troubling, many parasomnias that occur in childhood can resolve on their own. If concerned, a consultation with a sleep physician can help to determine the natural evolution and if any treatment intervention is required. A circadian rhythm disorder occurs when the internal clock regulating sleep and wakefulness is weakened or when it is misaligned with a person’s desired sleep period. There are three many types that include Delayed Sleep Phase Syndrome, Advanced Sleep Phase Syndrome and Shift Work Sleep Disorder. This disorder in which a person’s sleep is delayed by two hours or more beyond what is considered to be a normal bedtime. The delayed sleep time results in difficulty waking up the next morning at the desired time. This is a very common condition seen with adolescents who have a normal physiologic delay in the circadian sleep patterns. This has great implications on the next day learning potential, especially for early morning classes. Treatment may involve a combination of Bright Light Therapy and melatonin. Advanced sleep phase syndrome is said to occur when the timing of sleep and the peak period of alertness present several hours before (i.e. advanced) relative to societal clock. Those affected have difficulty staying awake unless they go to bed very early. They also tend to wake up very early and are unable to fall back asleep. It is the opposite of Delayed Sleep Phase Syndrome. Those with advanced sleep phase syndrome do not report that it affects their daytime work or school activities. The most common complaint is that their evening activities are cut short by the need to sleep much earlier than what is considered the norm. This can affect family and social relationships. It is most prevalent among older adults and is equally as common among men and women. Treatment may involve a combination of Bright Light Therapy and melatonin. Shift work sleep disorder is yet another type of circadian sleep disorder in which a person experiences a constant or recurrent pattern of sleep interruption due to shift work schedule, resulting in difficulties initiating and maintaining sleep and/or excessive sleepiness when awake. Other symptoms of shift work sleep disorder include difficulty concentrating, headaches, and low energy. Non-traditional shifts, particularly rotating shifts, force people to place their sleep window at a time that is not congruent with their underlying circadian clock. Rotating shifts also weaken the signals from the internal clock leading to greater difficulties with sleep and sleepiness. As a result, people with shift work sleep disorder may have trouble staying alert at their work shift and feel their sleep is unrefreshing. Treatment may involve Bright Light Therapy as well as sunglasses in the morning, melatonin and adjusting the work schedule. Bright light therapy is used to manage circadian rhythm disorders such as delayed sleep phase syndrome (DSPS). Light has the most powerful impact on circadian rhythms and so bright light therapy can be used to shift sleeping patterns back to normal. However, the timing of light exposure is critical. For DSPS, the light must be delivered to the retina as soon after spontaneous awakening as possible to achieve the treatment effect. Evening use is recommended for advanced sleep phase syndrome. There is less data about the effectiveness of light therapy for advanced sleep phase syndrome than there is for morning light exposure in delayed sleep phase syndrome. Melatonin is a naturally occurring hormone that is produced in the pineal gland, a pea sized structure in the centre of the brain. This important hormone helps to regulate your circadian rhythm. Normally, the production of melatonin is inhibited by light and secreted by darkness. For this reason melatonin has been called the hormone of darkness. The secretion of melatonin peaks in the middle of the night and gradually falls during the second half of the night. Even low light levels can diminish melatonin production to some extent. Interestingly, ingested melatonin has almost similar effect as the melatonin produced in the body. The human body produces its own melatonin starting two hours before bedtime, provided the lighting is dim. This natural action is known as “dim light melatonin onset” (DLMO) and helps keep the body on a regular sleep-wake schedule. DLMO can be measured in the lab and is considered the best test available for measuring Melatonin levels and Circadian Rhythm Disorders. It is therefore useful for assessing phase delays or advances of rhythms in entrained individuals. DLMO marker is also useful for identifying optimal application times for therapies such as bright light or external melatonin treatment. DLMO test is done at the sleep lab centre and usually takes place from 8pm until 3am. During the test patients are asked to stay in dim lighting and every hour samples of saliva, in the form of chewed on cotton balls, are collected. Afterwards, the melatonin concentration of the samples is measured. During the test the patient cannot eat or drink 30 minutes before each sample is collected. Also, permission must be sought from lab staff members before any electronic devices such as iPhone, iPad, etc are used, as these devices could alter the outcome of the test. For the entire study, patients are not allowed to have orange juice, bananas or caffeinated beverages. Be sure to consult the lab technician present during the study for advice regarding this issue. It is important to note the possible discontinuation of certain drugs a few days to two weeks before taking the test. Please consult our physicians regarding this issue as it is of important concern. If you have any questions, please contact us at the sleep clinic office.